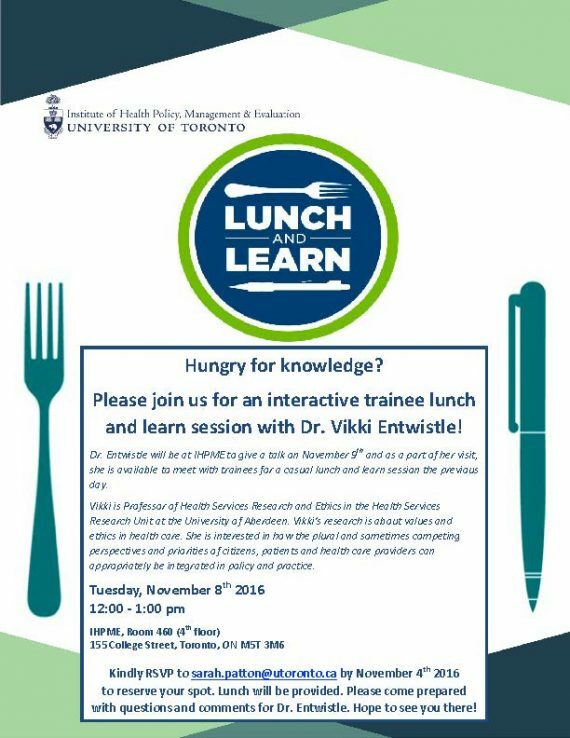 Dr. Entwistle will be at IHPME to give a talk on November 9th and as a part of her visit, she is available to meet with trainees for a casual lunch and learn session the previous day. Vikki is Professor of Health Services Research and Ethics in the Health Services Research Unit at the University of Aberdeen. Vikki’s research is about values and ethics in health care. She is interested in how the plural and sometimes competing perspectives and priorities of citizens, patients and health care providers can appropriately be integrated in policy and practice. Please come prepared with questions and comments for Dr. Entwistle. Hope to see you there! Kindly RSVP to sarah.patton@utoronto.ca by November 4, 2016 to reserve your spot. Lunch will be provided.